In today’s blog, I offer an excerpt from A Serpentine Path: Mysteries of the Goddess. The setting is Zaros, Crete, the time of year is mid-October. We had a scrumptious dinner of fresh fish, salad, fried potatoes, local amber-colored wine, and tiny olives. Later the two waiters, Themis and Nikos, bearing another pitcher of wine, sat down at our table. When we finished our wine, the young men offered to give us a lift back to our hotel on their motorbikes, suggesting we could have a coffee at the hotel bar. When we got to the hotel, they didn’t stop. “What happened?” I asked. “The bar wasn’t open at the hotel, so we’re looking for another place.” I wondered what Naomi, perched on the back of a motorbike and unable to speak Greek, must be thinking—especially since she was afraid of the unknown. We drove through the town and turned down a dirt road, arriving at the Zaros water factory. “We wanted to show you this,” they said sheepishly. “People drink our water all over Crete.” “O.K., “Naomi said, “but then you must take us back.” There were a few workers on the night shift, and the boys told us they had worked there too, before going into the army. Leaving the factory, we continued down the dirt road heading away from the town. “Where are we going?” I asked, wondering what we had gotten ourselves into. “Just a minute,” Themis said, as he got off the bike in front of what looked like a small house in the middle of nowhere. “We need to go back,” Naomi said definitively. “Yes, I already said that,” I answered. “Come inside,” Themis beckoned. 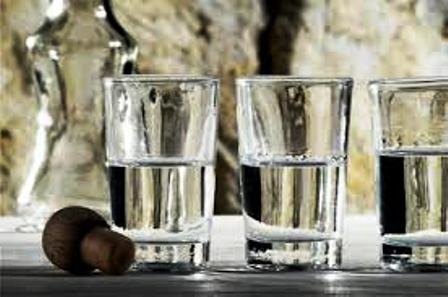 “We want to show you how they make the raki (the colorless alcoholic drink that had been offered to us in shot glasses us after meals). This is the still,” he continued, as he showed us into a small dark room with a glowing fire. “After the wine is pressed, they put the skins and stems into barrels like those you see in the corner. 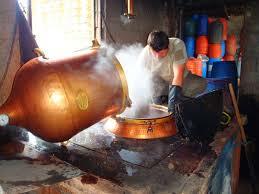 The mixture takes six weeks to ferment, and then they bring it to a still, where it is heated over a fire. The steam that rises is directed through long curved pipes, and comes out as raki,” he said, pointing to various parts of the mechanism. Nikos and Themis whispered translations of the songs from the Cretan dialect into Greek, eager that we understand everything. While Naomi and I had expected songs of wild men out the mountains, violence, and vendettas, we were pleasantly surprised to learn that most of the songs were about unrequited love. “I have worn out many pairs of shoes climbing the mountains to get a glimpse of her,” sang one. “My goats’ udders are sore because I sit and think of my girl when I should be milking my flock,” replied another. Cups of raki, potatoes, and pomegranates continued to be passed around. A Serpentine Path: Mysteries of the Goddess is available in Kindle and paperback. Carol P. Christ leads the life-transforming Goddess Pilgrimage to Crete. 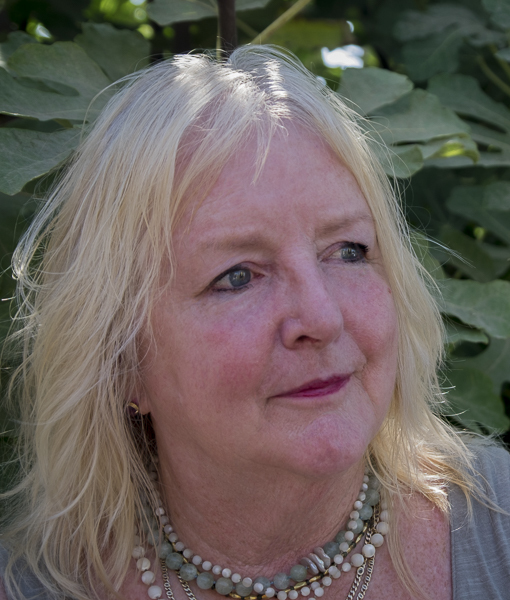 Carol’s other books include Goddess and God in the World (with Judith Plaskow) and She Who Changes and and Rebirth of the Goddess; also with Judith Plaskow, the widely-used anthologies Womanspirit Rising and Weaving the Visions. I was identifying with Naomi, annoyed, thinking I had been abducted, and then that sudden understanding of her situation, “like Persephone,” fabulous! But what does raki taste like? Raki is like ouzo, only better. It is colourless until you add water, when it turns milky white. It has a slight anise flavour. Now I’m thirsty, but it is not available where I live. I would say it has the slight taste of pepper, not sweet like ouzo. Thank you, Carol. Good story. Sometimes when traveling one just needs to take a leap of faith and trust the people you are with. Glad you and Naomi were able to do that in this instance. I was also a bit scared at first, but glad you remained calm and so got to see a part of life that few “outsiders” probably experienced. Makes me wonder how often fear keeps me from discovering beauty. So glad your memoir will be in print again! Looking forward to more! 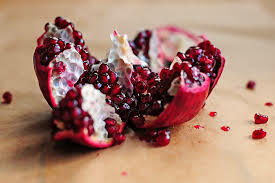 Love it that you made friends and found the pomegranate seeds and stayed like Persephone to hear the guys sing. It’s time for your book to reissued. Brava! Loved the story Carol! 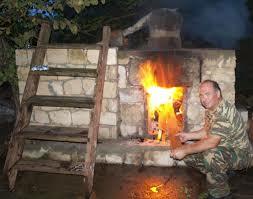 It reminded me of our wonderful time in Zaros during the tour, as well as sipping raki in various places (which I loved). And of the warm hospitality, lively music and sweet men in Crete. Some of my best travel memories are from unplanned encounters with strangers! What a wonderful story. I look forward to the book. It’s as if these men could intuit that you both were seeking The Mystery, seeking Her.